Princeville is my home and it’s also home to about 2,200 people who live here most of the year. There are many tourists and vacation renters that come back every year to enjoy this north shore haven. It’s the northernmost settlement in the state of Hawaii, so if you are a fan of “North Shores” and all the wave action in the winter, mild summers and sandy toes that come along with it… Princeville might be a place to check out. You don’t need a million bucks for a starter property here like you do in Hanalei and it’s nicely located up on the bluff so there is little possibility of flooding from a heavy rainfall. There is a real sense of neighborhood, of community, here. Although Princeville is mainly a big block of homes averaging $1 Million apiece, condos start around 375k and go well into the $1m range. Here is a Plantation of Princeville 3D model we shot. These sell around 600k. 3 bedroom 3 bath and a legal vacation rental. These get just under 200 a night to give you a ballpark of what you can expect out of your investment. For more information on Vacation Rentals or Transient Vacation Rental Licenses or TAT tax, read Ann’s articles. They are chock full of helpful information! Also she’s done an amazing Blog on every HOA fee in Princeville! Info on Vacation Rentals, Taxes etc. Information on 1031 tax exchanges. 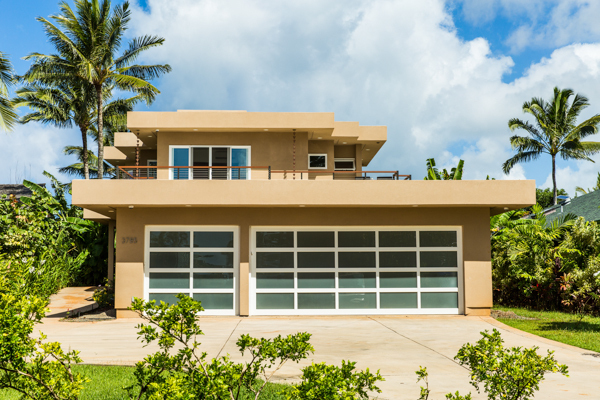 Here’s one of Princeville’s rarest condos on the ocean listed around 1.3m. 3 bedroom almost 1700 sqft condo that encompases the entire first floor of the duplex. This condo is located at Emmalani Court on the bluff. Building 1. There are also ranches over on Kapaka just Mauka (toward the mountains) of the highway. They aren’t vacation rental ready like most of Princeville proper, but they do have a Princeville address. Here’s another beautiful Kapaka ranch we did a full article on. We recently listed and SOLD this home! A little on the history of Princeville: It was named after Prince Albert Edward Kauikeaouli Lei O Papa a Kamehameha who visited the land in 1860. The owner at the time, Scot named Robert Crichton Wyllie really liked the little prince so he named the land after him. Prince Albert at the time was 2 years old and was the son of King Kamehameha IV and Queen Emma. Princeville was planted with coffee start but the weather didn’t cooperate so they planted sugarcane instead. It was full of cane for a few years and then was sold to a rancher. It was a cattle ranch from 1867-1968. Then it became a golf course and resort called “Princeville at Hanalei”. When you are in Princeville, head down to the end of KaHaku (the main road) and park at the St. Regis – or you can walk. The views of the bay from the hotel or out on the lawn are magnificent rain or shine. Living in Princeville and seeing the lush green mountains with the waterfalls going off most mornings, never fails to take your breath away. It never gets old. The Princeville Ranch also still exists and is family owned. 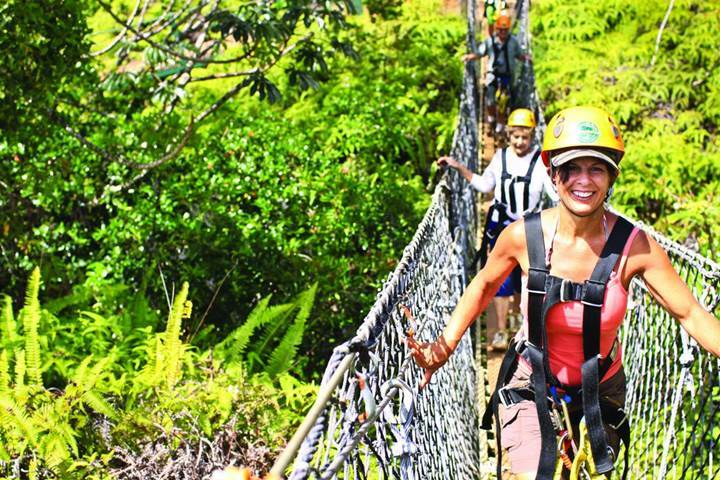 It’s worth a visit as well for a slew of adventures from equestrian to mountain biking and zip-lining. You can also take a helicopter ride from the Princeville Airport so you don’t have to drive down to Lihue and depart from there. Princeville is also sweet because the Princeville Center is walk-able from just about every home or condo. There you have a grocery store, several restaurants, banks, post office, and retail shops as well as a beautiful library and activity center. Check out more great information on the: Princeville Ranch here! 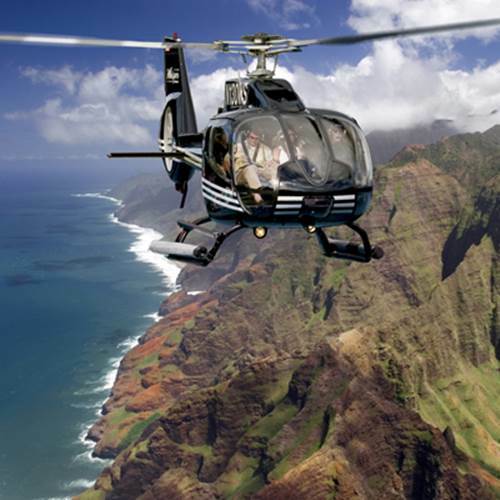 Click here to book a Helicopter Ride from Princeville and see our Garden Island from the Air!! One of the really WONDERFUL things about Princeville is that it’s in the VDA (vacation destination area) thus making almost all properties OK for immediate vacation rental without a license or permit to do so. With so many of us thinking ahead of retirement, buying a place that can begin to pay for itself until you are ready to retire is very appealing. Buy your home or condo in Princeville, choose a property manager, and then you have your place in paradise for the future and also to visit whenever you choose. It’s a win-win situation! Puamana of Princeville – Garden, Golf and Ocean View options 1 and 2 story!